Thick fog overnight and a foggy start to the day seemed set to slow things down a wee bit from our recent good run (let’s be honest, it’s been an excellent run), although a Lesser Whitethroat on morning traps followed shortly by a Tree Sparrow in the Obs mistnets showed that some things had made it in. The fog lingered so thickly in the North that censusing that section had to be put off to the afternoon (in North in particular, it helps to be able to see where you’re going as well as being able to see the birds), but the morning produced a few nice birds down south, with Red-backed Shrikes having obviously made a small arrival and a Gadwall over South Harbour a notable occurrence (they’re less than annual on Fair Isle, although this was our second of the spring, both found by fly-over duck-magnet Richard!). Long-stayers were represented by the Caspian Stonechat and Kumlien’s Gull (which is now visiting the Haa garden for scraps! ), whilst singles of Yellow, Blue-headed and unidentified flava Wagtails added splashes of colour, Siskins increased to 5, Lesser Whitethroats to 4, a Common Rosefinch was confirmed as not being the ringed bird from earlier in the week and a breeding plumaged Great Northern Diver was on the sea off South Light. After getting snarled up in the office on various emails relating to distinctly non-bird issues, it was a relief to get out into North after lunch once the fog had lifted, although with a talk to give in the evening, I did send a text saying ‘I could do with an uneventful census, but I’ve brought my camera, so that should mean I see nothing’. As I got up to my sixth Spotted Flycatcher by the time I reached South Naaversgill, I was beginning to think it might actually be quite interesting, when an unmistakably dazzling sight (it is possible to dazzle, even with just the two most basic of colours) of a bird jumped up onto the ledge in front of me – male Collared Flycatcher! My first view of this stunning bird. 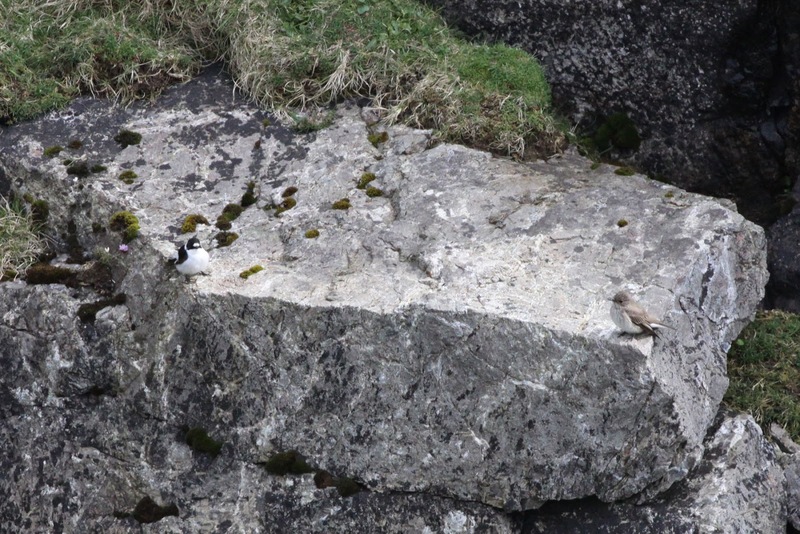 It posed on the clifftop long enough for me to regain my composure, get my camera out and summon the team. Closer views showed the flight feathers to be rather brown-tinged, indicating a first-summer bird. It continued to parade around the cliff top whilst various staff and visitors came up to enjoy it and what a little stunner it was. It may not be the most Mega of the Birdguides’ Megas, but none the less, they’ve used up quite a lot of red ink on us this year (it’s our 5th !!! this year – has anywhere else had that many on one spring?). 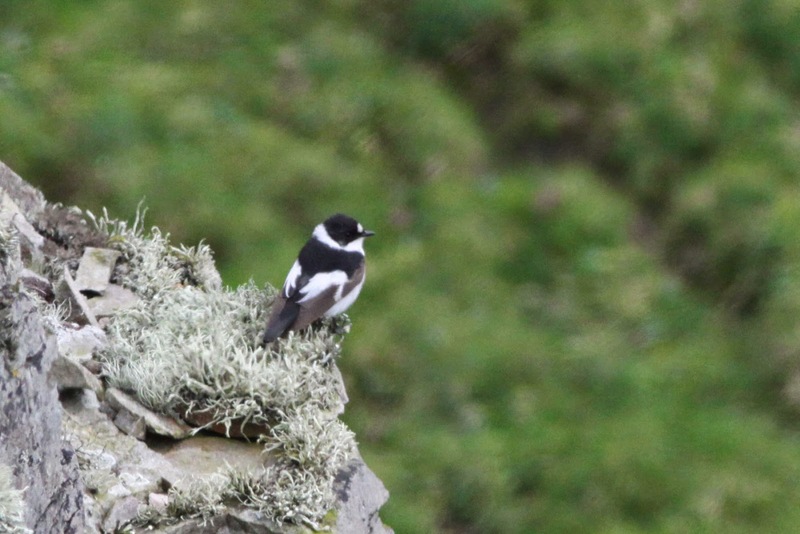 It’s also an absolutely fabulous little bird, with Richard’s description of it being ‘more black and white than a Pied Flycatcher’ being absolutely spot on. 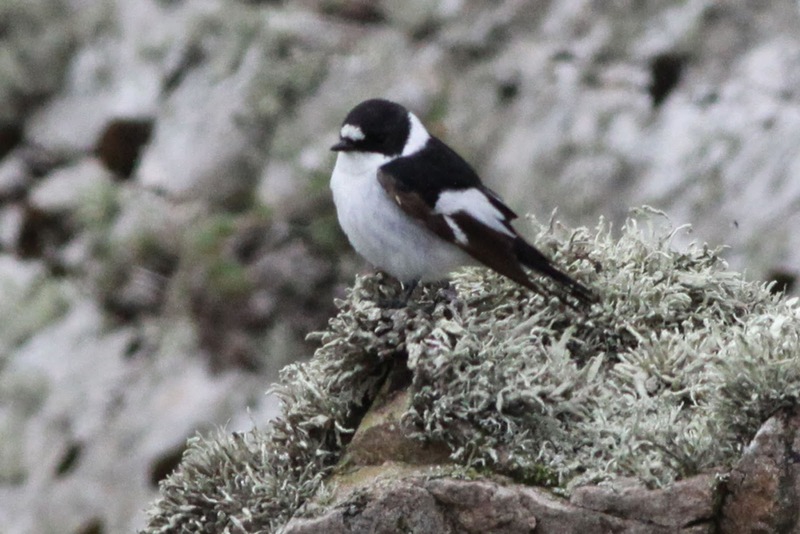 Fair Isle's 6th Collared Flycatcher, following an autumn bird in 1986, spring males in 1998 (on exactly the same date as this one), 2004 and 2011 and last year's spring female. They always look exceptionally good on the dramatic west cliffs and, as we sat watching it flitting around the cliff face, with a flat calm Atlantic behind us, we thought there was surely no place better to be. The rest of North census was largely quiet, although another little flurry of sightings in the far North corner saw female Red-backed Shrikes on Dronger and Ward Hill (the latter of which shared the same rock with a male Snow Bunting briefly, although the Snow Bunt was seen with a female of his own species as well later) and Black Redstart on Dronger. Whoever is on North census always likes to see something on the very top of Ward Hill, so you can call it out at Log and prove that you did make it to Fair Isle's highest point (217m). 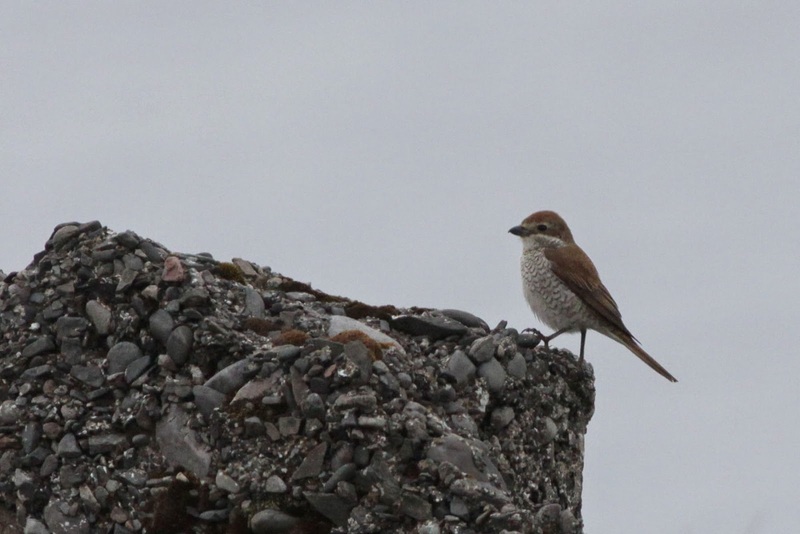 This Red-backed Shrike is perched on the remains of the old WWII radar station. The final Red-backed Shrike tally for the day was six (2 males, 4 females) and with more easterlies due, there may be more to come. For anyone out there who is beginning to go off us because of the birds we’re getting this spring (and I get the feeling there may be one or two of you, judging by the texts we’ve received from a few people! ), I can only say that my team do work very hard for all these birds (one of these days we’ll fit data loggers to ourselves to see how many miles we cover) and we really do appreciate the birds we're seeing! This is surely, even by Fair Isle’s incredibly high standards, one of the best springs the island has had and we're loving every day of it. 'Come here often? ', a Spotted Flycatcher meets its rarer relative.